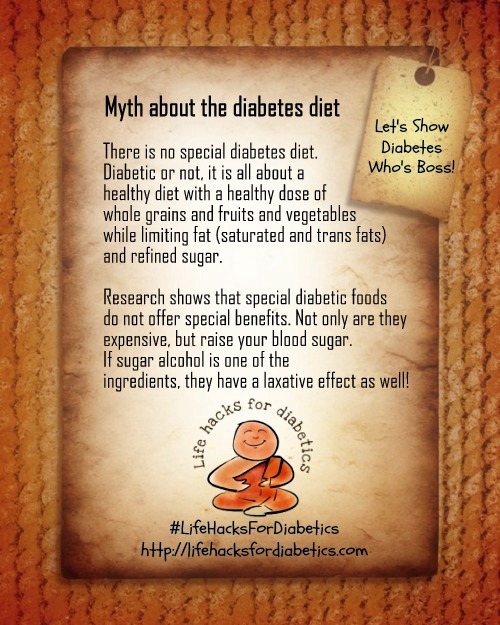 There is no special diabetes diet. Diabetic or not, it is all about a healthy diet with a healthy dose of whole grains and fruits and vegetables while limiting fat (saturated and trans fats) and refined sugar. Research shows that special diabetic foods do not offer special benefits. Not only are they expensive, but raise your blood sugar. If sugar alcohol is one of the ingredients, they have a laxative effect as well! More myths and facts about diabetes here. M is for Myth about the diabetes diet.